Index funds are on a roll. Funds that passively track indexes are popular because they’re cheaper than the alternatives run by active money managers, and the robotic, rules-driven funds often outperform their human rivals, too. The idea that index trackers would own the entire market is far fetched, of course, but the impressive trajectory of passive funds has people asking how much more they can grow, and what that means for how markets work. 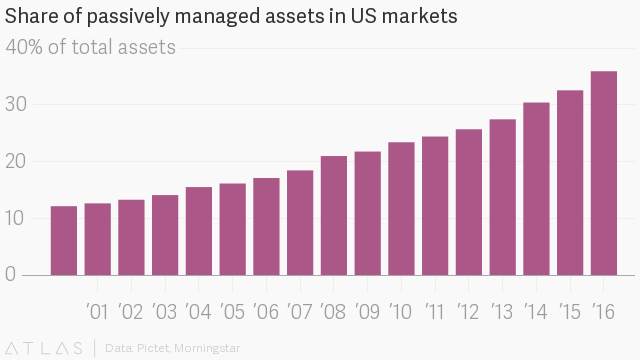 PwC reckons that passive funds’ share of all global assets will grow to about 22% by 2020, up from 11% in 2012. Popular concerns about the march of passive funds include the misallocation of capital, meaning that cash flows into stocks with the biggest market capitalization, and not necessarily those with great management and innovative ideas. Corporate governance is another worry—an index fund manager may be less likely to hold a board or a CEO accountable with the voting power that their shares confer. Matt Levine at Bloomberg explores this issue regularly, including the suggestion that index funds are worse for capitalism than communism and whether common ownership reduces competition. And then there’s the financial plumbing to worry about. Wall Street brokers say the shift to index-tracking has changed the way they buy and sell securities. Passive investing could drain liquidity during the middle of the daily trading session, because index funds are often tied to the last price of the day, which is determined in the closing auction. Anyone who needs to get in and out of stocks mid-session could have a harder time doing so. There are already signs of this happening, though not everyone agrees on the severity and the reasons. One line of thought is that the market will eventually fix itself. If prices get too far out of line because of passive funds’ peculiar behavior, active managers will have an easier time making money by exploiting the irregularities. When they shine—and generally active managers haven’t shined for some time (paywall)—cash will flow back in their direction. In theory.